INCREASE RESULTS BY UP TO 5 TIMES AS MUCH! effect between the two products. We have found that our customers who use our Daily Exfoliating Cleanser + Revitalizing Marine Moisturizer together have experienced a synergistic effect between the two products. What comes with this combo? 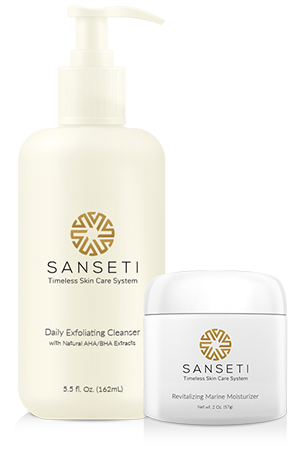 Combine gentle cleansing and softening for a brighter complexion. Before using other skin care products, use the face cleanser to eradicate harmful oils and toxins that sit on your skin and cause blemishes, acne, and bumps. Discover instant age-defying results with this unique blend of natural ingredients. Draw out deeply embedded skin impurities and stabilize scarred tissues to effectively hydrate, soften, and sooth your skin.